You are going to Watch Naruto Shippuden Episode 284 English subbed online free episodes with HQ / high quality. Stream Anime Naruto Shippuden Episode 284 Online English sub The Helmet Splitter: Jinin Akebino! During the night, Kakashi tells his squad to take a rest but maintain their awareness. Two shinobi arrive from HQ bringing an enormous item to Kakashi and then he hands it over to Sai, with Lee assigned to be his bodyguard, to aid in sealing the reanimated ninja. Sai becomes stressful as he recalls a seal variation of his Super Beast Scroll ability that requires emotional energy that can be harmful if not in a controlled state of mind. At dawn, the reanimated ninja sprawl out and resume killing Allied ninja on the field. Among the enemies is Akebino Jinin who is being confronted and slashed by Kakashi as Ensui binds Jinin’s body so Sai could perform the Sealing jutsu. However Gari arrives and Lee defends Sai and Ensui. 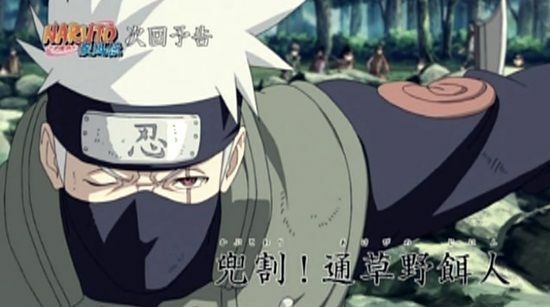 Thinking of his time with Team Kakashi, Sai is able to control his emotions to execute his Sealing Jutsu: Crouched Tiger Bullet to trap Jinin in a scroll.